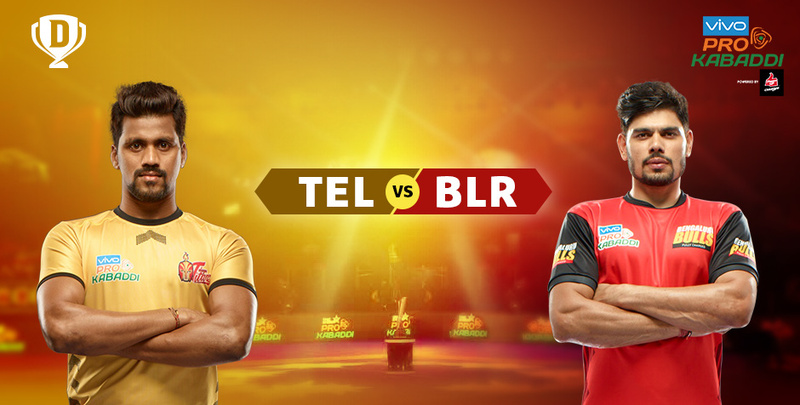 The Bengaluru Bulls vs Telugu Titans is a classic clash of the veteran underdogs. The Bengaluru Bulls started strong but over the years they have slumped to the bottom of the leaderboard. On the other hand, the Telugu Titans have had a rollercoaster journey in the PKL, they seem to have the form since the last one year. But then, consistency has always troubled the team but this does not stop them from entertaining the audience with some thrilling matches like the previous Telugu Titans vs Bengaluru Bulls clashes. The Bengaluru Bulls have always had a balanced mix of players but never have they been able to convert their package to a major win at the later stages of the season. The Telugu Titans always come into a match with the fire to win but luck seems to leave their side. But team Telugu have set out again in season six with the goal to win the PKL. The Bengaluru Bulls too made some interesting signings and the owners have put together a team of title contenders. In 2017 - season five of the PKL the two teams battled thrice through the season and the Telugu titans vs Bengaluru bulls match on all three occasions was a display of equal strengths. The Bengaluru Bulls won the first match but the next two matches finished in a tie. So, let’s look at their 2018 squads and find out the strengths and weakness of both teams for season six of the PKL. Bengaluru Bulls come into season six under the strong leadership of captain Rohit Kumar, known for his Super 10s and his incredible agility. He was also the MVP of season three. one of Season 5's most impressive young talents, Telugu Titans Vishal Bhardwaj shall be leading the way to glory for his team. Kashiling Adake from team Bengaluru is a well-known raider and particularly applauded for his flexibility, Adake is known to do damage in every raid and possess the ability to get out of a tight situation. For the Telugu Titans, Iranian Mohsen Maghsoudlou’s superior raiding skills and international experience of the game make him a valuable asset to the team in a Telugu Titans vs Bengaluru Bulls game. Mohsen Maghsoudloujafari will be starting for his second campaign with the Telugu Titans after scoring 47 points in 16 games in his debut season last year. Rahul Chaudhari from Telugu Titans team has scored the most points in PKL. The strongest raider in Team Telugu, he will play an important role in Telugu Titans vs Bengaluru Bulls matches. The Bengaluru Bulls come into the game against Telugu Titans with one of the strongest lineups of the PKL and includes a good blend of raiders and defenders. Same can be said about the Telugu Titans who also have two promising all-rounders Armaan and Mahender Reddy. Mahender Singh A.K.A Bulldozer is among the best for left cover defence. Singh also finished season five as the most successful left cover defender. Ashish Kumar is also a master defender and along with Mahender Singh, the duo will prove to be a nightmare for raiders during Telugu Titans vs Bengaluru Bulls matches. The Bulls also have a unit of international players. Dong Ju Hong and Gyung Tae Kim of Korea are immensely gifted athletes who bring valuable international experience to the team. The Bengaluru Bulls lead the tally in the intial against the Telugu Titans but we must also take note that the Titans ensured this was not repeated and on both the other occasions the Telugu Titans vs Bengaluru Bulls score ended in a tie. Season six will let this southern rivalry of Bengaluru Bulls vs Telugu Titans continue and the new teams are sure to spice up the battles. Dream11 lets you take charge of the fantastic Pro Kabbadi teams as a manager and successfully indulge in all parts of the team strategy. Select your team of raiders, all-rounders and defenders before every match and stand a chance to win rewards for your selections during Telugu Titans vs Bengaluru Bulls matches. Your sports strategy skills will be put to the test against the best in various contests on the platform. So, get started on the official Dream11 website or download the official mobile app and join in the fun.